Staying away from daily newspapers is a matter of mental hygiene. One side of the problem is the news itself. Rob Wijnberg does an excellent job explaining what exactly is the problem with news in his article The problem with real news — and what we can do about it. On the other hand, we already wrote about what you could read instead of reading the newspapers. When Benjamin Day founded the New York Sun in 1833, in the flush of Jacksonian egalitarianism, he was breaking that journalistic mold. Before the Sun, the target audience for most papers was the wealthy and the professional classes. Day explicitly appealed to “mechanics and the masses generally.” Before the Sun, most papers cost six cents. The Sun cost a penny; hence the name “penny press” that attached to it and its imitators. Before the Sun, a typical daily newspaper in New York City could expect to sell roughly 1,200 copies, with the total circulation of all eleven daily papers in the city in 1833 reaching only 26,500. After the appearance of the penny press, readership skyrocketed. In June 1835, by one report, the combined circulation of the penny papers alone was 44,000. But the real difference between these new papers and the traditional press—and the real reason for their swelling circulation—was their content. If the six-penny papers were primarily opinion sheets, the penny papers were news organs, the very first daily news organs in the country. In the penny papers one could at long last read about life in the city, the nation, even the world, and discover not what an editor thought but what people had done, or at least what they were purported to have done. Nor was it only a matter of news; it was also a matter of purview. According to the press historian Michael Schudson, the penny papers were the first to acknowledge the importance of everyday life and the first to promote the “human interest story,” which would soon become a journalistic staple. Still, the success of the penny press raised an inevitable question: Why did news rather than opinion appeal to the mass reader? One could certainly attribute the allure of the news to the need among atomized citizens in burgeoning urban areas for some sense of common experience such as news provided. Or one could attribute it to the ability of the news to reinforce the suspicion on the part of many citizens that depravity lurked just beneath the city’s surface, a suspicion that undermined the moral authority of the local elites. Still another factor may have been an intensifying sense in people that they had to know what was happening because as technology shrank the community and the nation, events that once seemed distant might now impact on their lives. No doubt all these factors, as well as others, played some role. But the single most important attraction of the penny press may have been the most obvious one—namely, that for a constituency being conditioned by trashy crime pamphlets, gory novels and overwrought melodramas, news was simply the most exciting, most entertaining content a paper could offer, especially when it was skewed, as it invariably was in the penny press, to the most sensational stories. In fact, one might even say that the masters of the penny press invented the concept of news because it was the best way to sell their papers in an entertainment environment, and it was certainly no small matter that while the six-penny papers were sold primarily through subscription, the penny papers were hawked on the streets, meaning that the content had to be interesting enough to entice readers into buying a paper. 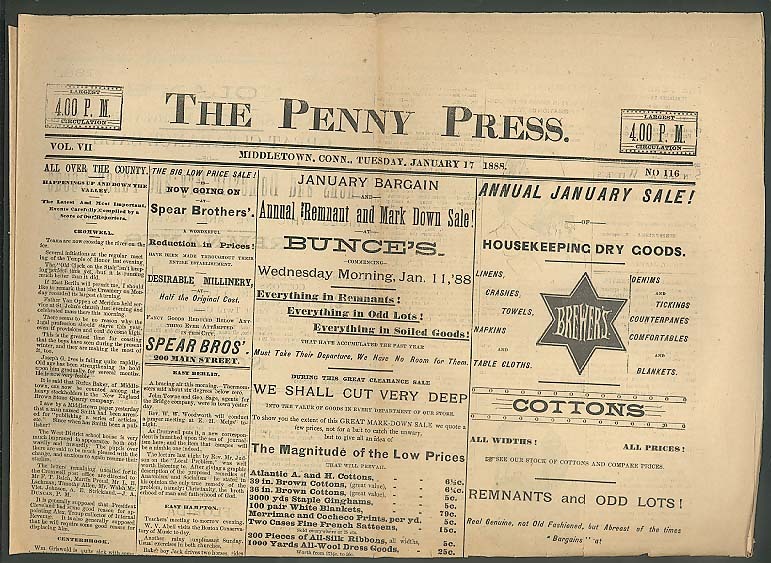 The publishers of the penny press didn’t necessarily protest the idea that they were in the entertainment rather than the information business. From its inception the penny press began specializing in crime, with an emphasis on murder, to distinguish it from what the New York Herald called the “dull business air of the large morning papers.” In its first two weeks of publication in May 1835, the Herald itself featured three suicides, three murders, the death of five persons in a fire, a man accidentally blowing off his head, an execution in France by guillotine and a riot in Philadelphia.